Slightly Mad Studios has confirmed that the Wii U's hardware simply isn't beefy enough for Project CARS. Project CARS, Slightly Mad Studio's ambitious ultra-realistic racing simulator will be skipping Nintendo's comparatively underpowered Wii U console, confirmed the developer today. "The official line is that we're awaiting an announcement from Nintendo on new hardware. As of now pCARS is simply too much for the Wii U," Studio head Ian Bell told Nintendo Life. 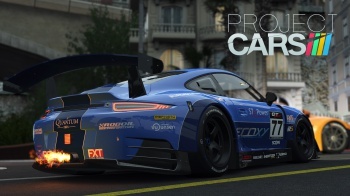 Publisher Namco Bandai later added that "Despite much perseverance on the Wii U version of Project CARS we will no longer be actively pursuing development on it as the quality does not meet our own high standards nor our intended vision for the title on this platform. "We eagerly look forward to any announcement of further hardware from Nintendo but right now Project CARS is simply too much for Wii U despite our very best efforts. Apologies to our Nintendo fans out there that have been waiting for further news on this but have no desire to release a product that isn't at the very least comparable with our highest-rated versions on other platforms. We optimistically look forward therefore to what the future may hold." So that's that, I guess, no Project CARS for Nintendo fans until the NX's hardware stats are finally revealed.